Authentic Victorian Tile Production — Tile Source Inc.
Our encaustic floor tiles are handmade, using classic techniques that haven’t changed much since the medieval era. This results in hardwearing tiles that are suitable for inside and outdoor use. We have a standard range of encaustics that are listed on the resources page. We also produce bespoke encaustics to match original patterns or to create a new unique design. We can produce CAD layouts using your specified dimensions, for one of our standard layouts or something a bit more bespoke. Our CAD layouts are a great tool to help visualise how a layout will look in certain location, by using 3D perspective viewpoints of a room or path they also provide a highly actuate quote. 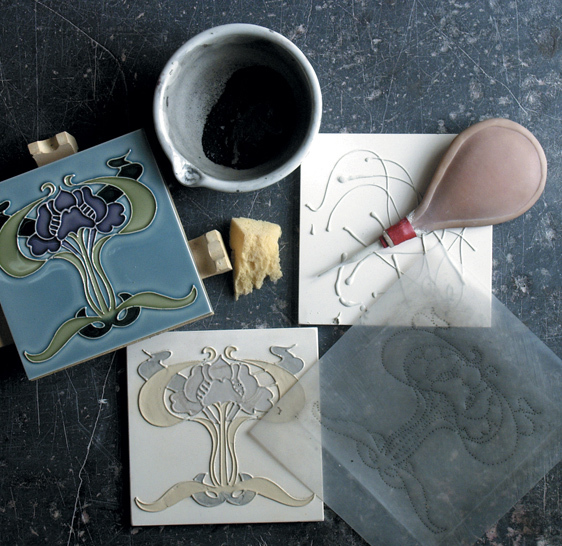 Our encaustic tiles are produced, by impressing a pattern in the unfired clay to a shallow depth using a hand carved mould. The resulting indentations are then filled with a liquid clay, or slip, of contrasting color. We hand tube-line a range of products to produce bespoke panels, fireplace tile sets and a whole lot more. The process of tube-lining is achieved by piping an outline in slip clay on to an ordinary plain, blank tile, to create a raised outline. Coloured glazes are then are applied between the piped clay outline to reach the desired look. We have a standard range of tube-lined products that are ideal for most situations that can be found in our wall tile brochure. We offer a complete design service, which accomodates any size commision, from one off individual tiles to large scale complex panels. Our design team can advise on the versatility and limitations of the process and assist in creating mock-up artwork and sample tiles. The process of screen-printing is achieved, by using a woven mesh to support an ink-blocking stencil to create a desired pattern or image. 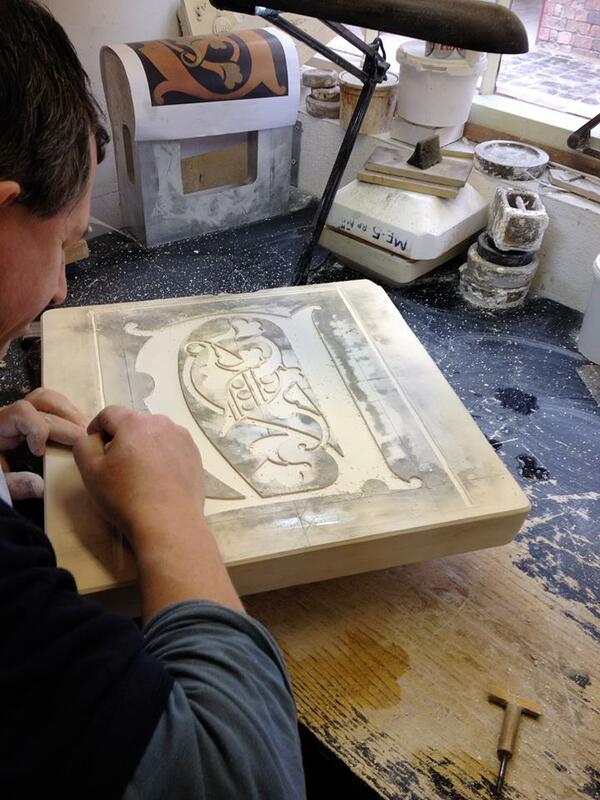 We screen-print a range of products to produce a wall tiles, teapot stands and a whole lot more. We have a standard range of screen-printed products that are ideal for most situations that can be found in our wall tile brochure. We also offer a bespoke service if you require a restoration match or a bespoke product to be made. Our design team can produce artwork for you or process your design to be ready for print. We have produced a vast number of designs, some using single colour printing which is ideal for creating patterns. Others are built up with multiple layers to create more detailed images. The slip casting process involves a liquid clay body slip, that is poured into plaster moulds, that over time forms on the inside cavity of the mould creating a cast. 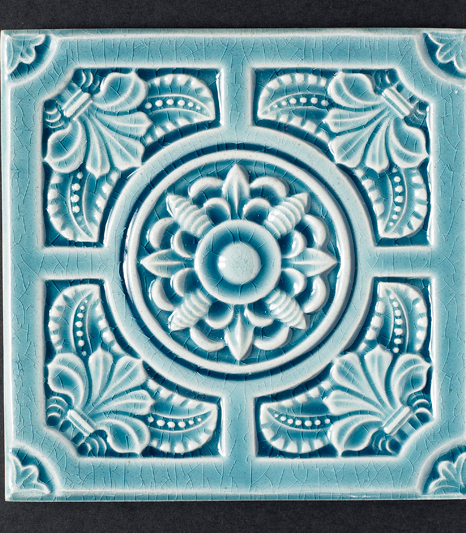 We are able to make many different shaped products using slip casting, from large shop front faience pieces to intricate relief tiles. 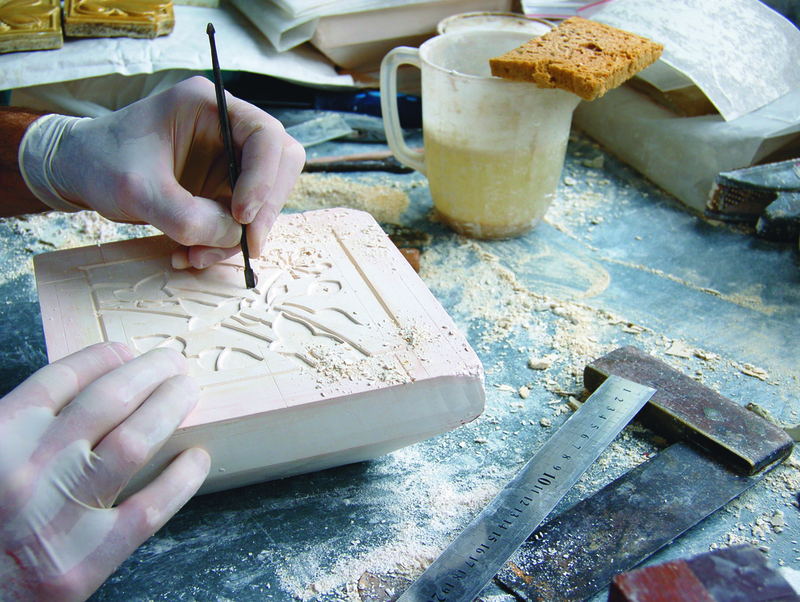 It also allows for a higher detail mould to be used compared to dust pressed moulds. 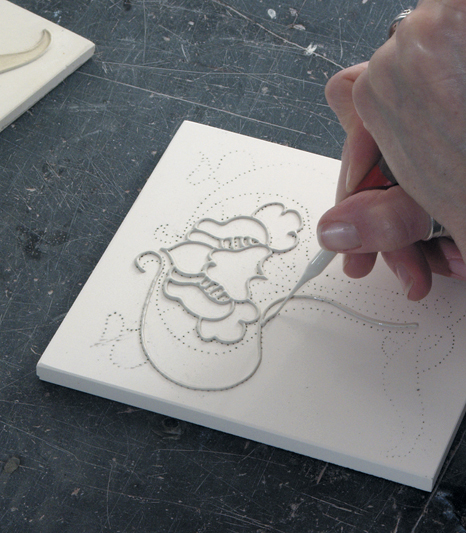 Our dry pressed tiles are manufactured using a Victorian powder press that compacts powdered clay into a metal mould; this allows us to repeat a relief tile design consistently. 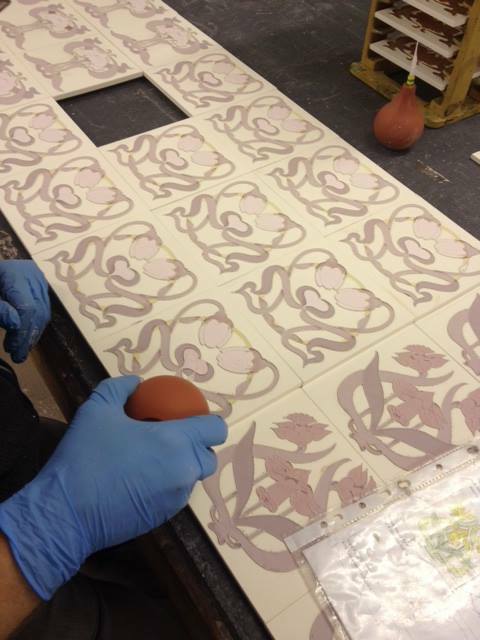 Dry pressing tiles is ideal for reproducing large quantities of the same design. We have a standard range of embossed products that are ideal for most situations that can be found in our wall tile brochure. 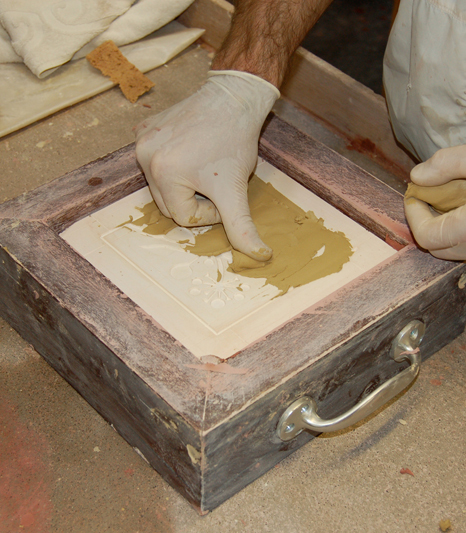 Hand dipping involves dipping tiles face down into a ceramic glaze, for a period of time by hand. When the tile is removed subtle differences in depth of the glaze, this gives each tile a unique characteristic of different shades across the surface. 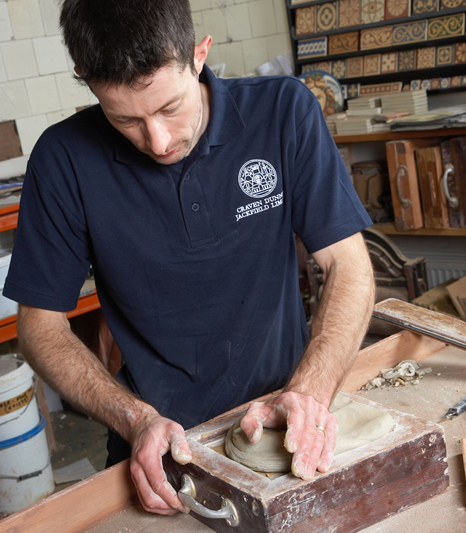 We use special formulated glazes, which are very close to the original recipes used in the Victorian era. Hand dipping into this type of glaze gives tiles a great depth of colour and a near exact reproduction of a Victorian tile. We offer a colour matching service that involves us testing glaze formula’s to find the one that best matches your sample. 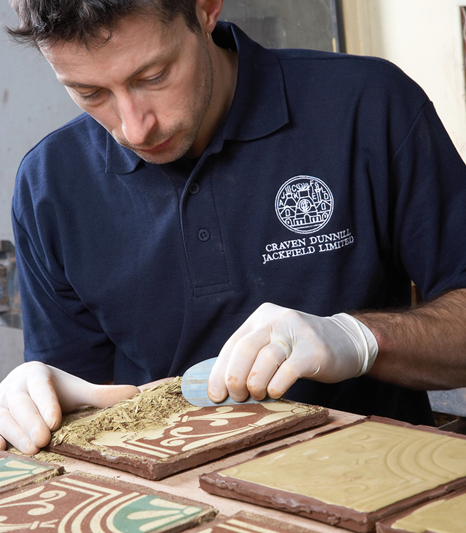 This service is ideal for restoration work especially when using existing tiles with the new to ensure a perfect match.